Hello Sandy! If your smile could use some brightening, what are you waiting for? Professional teeth whitening and teeth bleaching are the easiest ways Murray residents can dramatically improve their appearance. 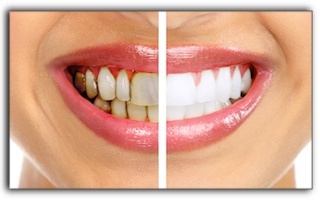 It is important to realize that not every smile responds the same to teeth bleaching. The degree of whiteness attained and the treatment time necessary depends on the type of stains being treated. 1. Surface or extrinsic stains are the most accessible and easiest to remove. They are caused by the usual suspects: coffee, tea, wine, cola, smoking, and the natural aging process. 3. Combination: Some Murray dental patients have both extrinsic and intrinsic staining. As we age, our teeth change – regardless of how well we take care of them. Two things that work against us are that our enamel thins while the dentin underneath fades and yellows. Again, the extrinsic stains on the enamel are the quickest to lighten, but ongoing treatment with a peroxide-based penetrating whitener can lighten the deeper discoloration. It is best to trust fast teeth whitening treatment to the care of an experienced dentist such as Clint Blackwood of Salt Lake Dental Care in Murray. Clint Blackwood and the experienced team of dental professionals at Salt Lake Dental Care have been brightening smiles since 2005. We also offer wisdom teeth removal, Invisalign, sedation dentistry, porcelain veneers, and teeth whitening.